One of the silliest sights in the world is the long, luggage-clogged line of passengers in Boarding Group 6 who stood up the moment it was announced their plane was boarding and continued to stand despite the fact that it will be like 20 minutes before flight attendants are done with the passengers in first class, passengers who paid extra to board early, passengers with kids, passengers with disabilities, credit card rewards program members, military service members, Boarding Group 1, 2, 3, 4, a high-school soccer team who just all really want to sit together, and Boarding Group 5. Stop this. Your seat will be there. Considering how many people willingly wait in long lines, it’s surprising how much they hate it. Hoping to appease an increasingly wrathful public, lots of airlines have tweaked their boarding processes in recent years. Most recently, United Airlines implemented a new boarding method which insists on just two orderly lines and invites passengers to remain seated until it’s their turn to join one of the two. Communication is better too -- there are extra signs around the gate area and new, streamlined instructions for United employees to relay over the intercom. And if you’ve got the United app, it’ll now send you a notification when it’s time to board. Ill-conceived boarding methods have ramifications beyond fleeting discomfort. 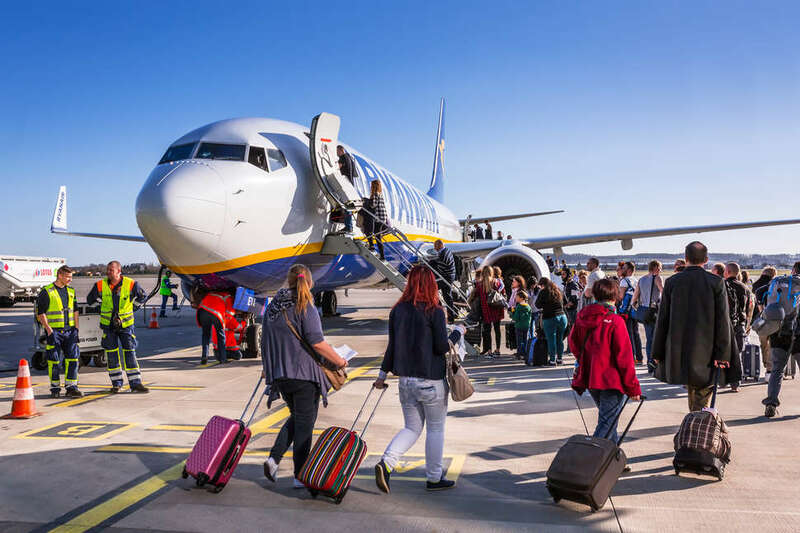 Just as legroom has been progressively decreased over the last few decades, so boarding times have gotten longer; delayed flights cost the US more than $4 billion per year. 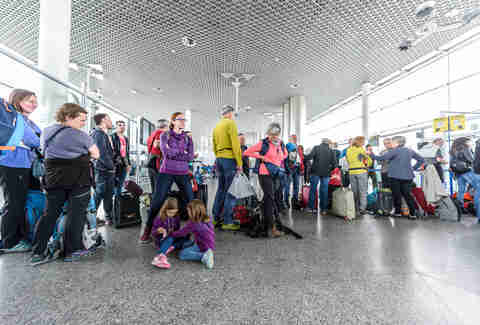 Everyone who has boarded a plane seems aware that the boarding processes are largely inefficient, but not necessarily what the faster alternatives might be. We’re going to break down five methods that are either commonly used by major US airlines, or should be. And we’re going to rank them, because that’s always a fun thing to do. Is the most commonly used method also the worst? Yes. You are not surprised. A ton of the major US carriers board their priority passengers (card members, first class, etc.) first and then their plebeian passengers by groups, or “blocks,” starting from the back of the plane and working their way forward. This takes forfuckingever; passengers are often stuck waiting for the person in front of them to hoist their luggage and find their seat, and end up sitting down basically one at a time. This method can routinely take up to 40 minutes, although in a controlled trial (Mythbusters) this method put 171 passengers onto an Airbus A321 in 24 minutes. (same plane, same number of passengers). America at times has not cared for it; either way, “elite flyers” still board first. This is exactly what it sounds like. No assigned seats. No boarding zones that correspond to assigned seats. Chaos. Anarchy. Basically, you’re in Zone A, Zone B, or Zone C, and when it comes time for your zone to board you just board. How does one get in Zone A? Paying extra. Yes. You are not surprised. The whole fun and civil process is sometimes affectionately called the “cattle crush,” and it is much faster than block boarding. Our primary method is literally less effective than no method at all. Is it stupid: Doesn’t seem to be? The Flying Carpet involves a literal carpet, on which 30 or 40 passengers stand at a time over a mark that corresponds to their assigned seat. They board the plane in linear order according to where on the carpet they were standing; the seating layout on the carpet has been designed so that the person who walks onto the plane in front of you won’t be in your way as you find your seat, and so that you won’t be in the way of the person who boards behind you. Once you’re all aboard, the next 30-40 people take their positions on the carpet. Mythbusters completed its Flying Carpet boarding in just 13 minutes. Dive even very shallowly into the rabbit hole of airline boarding procedures and you will soon learn of one Jason Steffen. Jason Steffen is an astrophysicist who, a decade ago, created an algorithm that boarded passengers so efficiently that representatives from every major US airline met at an off-the-books summit and swore never to use it, for to do so would mean the mutually assured destruction of every airline carrier that wanted to continue bleeding passengers for early boarding and checked baggage fees. The calculations were locked away and their location never revealed, though there are rumors of a Saran-wrapped Samsonite carry-on buried beneath Ft. Lauderdale. 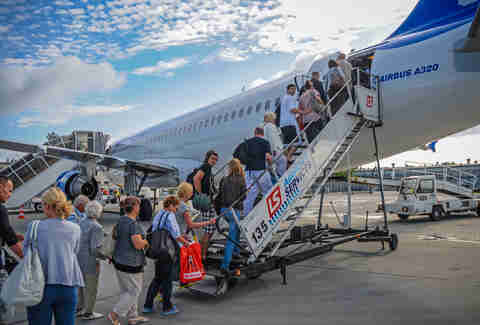 Basically, the Steffen method staggers passengers, ensuring none of the people boarding at the same time are seated anywhere they’d be in each other’s way. That way, they can basically all sit down at once -- no waiting for one person to sit down at a time while a bottleneck forms behind them. Have any airlines expressed interest in giving this a try? No. You are not surprised.